Yueju Opera performance, also known as Shaoxing Opera, an local art form originated in the early 1900s and is only second in popularity to the Beijing Opera. The picturesque white buildings of Huatang Village, east China's Zhejiang Province, line a maze of walkways through the old water town. It's easy to get lost on the stone-covered paths while exploring the quiet area – it happened to me twice. Walking through village, at times, the only sound comes from the small streams that run alongside the paths. The red lanterns swaying above the streets are a constant reminder of the coming festivities. 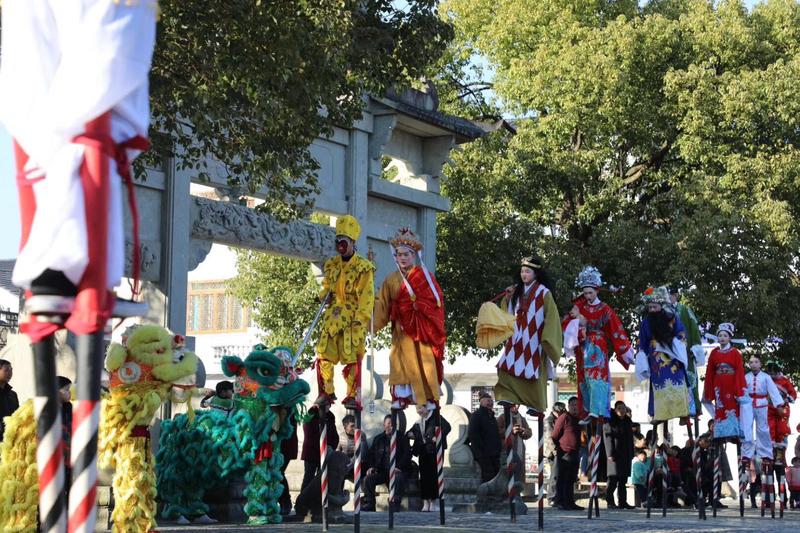 But the quiet village gets a jolt of excitement on the day of the Yueju Opera performance. Also known as Shaoxing Opera, the local art form originated in the early 1900s and is only second in popularity to the Beijing Opera. As the lion dance was performed to the sound of beating drums and blaring horns, a buzz grew in the air. In a courtyard surrounding a historic stage, a crowd of nearly 200 filled the seats and available standing room. Generations of families watched the drama unfold on the elevated platform. Grandparents held their restless grandchildren, while mothers and fathers recorded the century-old opera through modern smartphones. The high-pitched singing rang over the crowd as one scene after the other came to an end. The crowd dispersed afterward, still buzzing, as the performers disappeared into the dressing room. The Yueju Opera appears to be alive and well in Huatang Village and the curtain will remain open for generations to come.